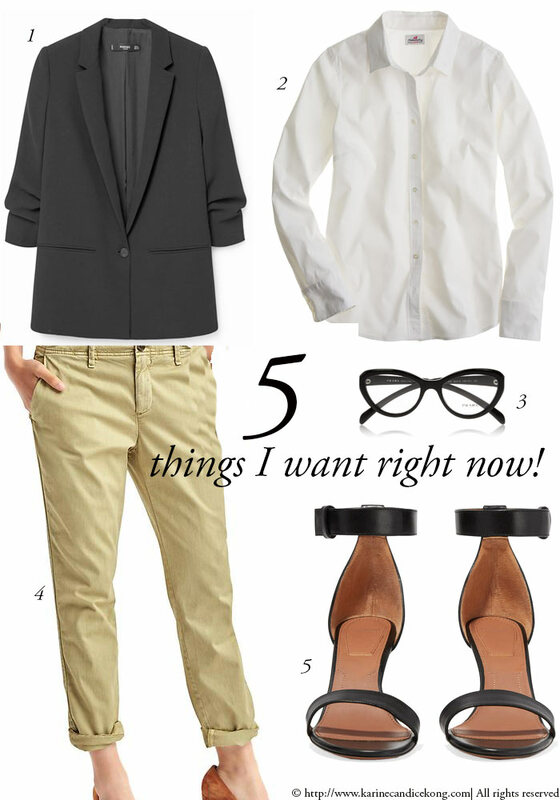 5 things you want right now! I recently asked Steve to bring me back a couple of chinos (4) from GAP and Boden I had in my wardrobe in London. I hadn’t worn them for a while yet and kind of forgot about them until Elodie mentionned she wanted to throw her yellow ones and I talked her out of it. Chinos are like biker jacket, French trench and Stan Smith. They are really timeless pieces to fall in and out of love when you’ve seen them too much. Nonetheless, they never fails to deliver the good. I love how Jenna Lyons, Creative Director of J.Crew wears her chinos here with high heels and this more casual look from Comptoir des Cotonniers, with a trench and trainers. The great thing about it is that they are also inexpensive fashion pieces and you can have fun with various colours. Both Gap & Boden have great sale on at the moment and you can grab some for less than £25. Since I spent years wearing mine like the look 2, I have decided to up my game and wear them with heels. J.Crew has some fantastic white fitted shirts but the one I prefer (featured above) is the petite stretch perfect shirt (2). Wear it with this ruched sleeves jacket (2) from Mango. Shoes wise, I think these Retra black sandals (5) from Givenchy are stunning. If they are out of your budget, check out these on Asos and this pair of sunglasses which I will be needed soon.